The Mutron Biphase is a legendary phasor pedal, designed by Mike Beigel along with Aaron Newman at Musitronics USA in about 1973-4.. The Mutron Biphase Biphase is a 1x12 stages or 2x6 stages optical phasor with 2 sweep generators ( LFOs) for square and triangle modulations. 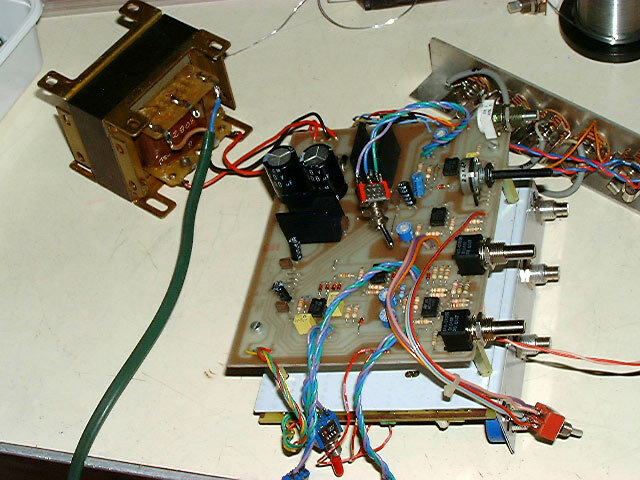 There is also a "pedal" CV input to control each phasor manualy like a filter. After a long brainstorming about "what kind of LFO?" , the solution retained is to stay glued to the vintage Bi-Phase concepts of a pair of simple independant sweep generators. Pulse and triangle modulation waveforms are available. LFO1 frequency is under CV control. Both sweep generators have Freq ( speed) and Depth potentiometers . There are 2 LFO outputs , a CV-Pedal input , all are assignable as you want. It is 100% analogic and optical ! Here is a synoptic, of the structure of the clone ... Bypass VCA stages and PSU are not shown here. Green and Magenta arrows are CVs , blue for audio. For an obscure format reason the clone is composed of 2 pcbs. They can be used independantly. 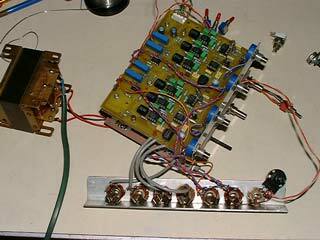 ( ie: to build a dual biphase = quadriphase by stacking many phasor pcbs....). Wiring of each pcbs is very "open": it is possible to assemble an exact clone of the vintage Mutron Bi-Phase or to wire it as a deeply customised synth module with all i/o connected to jacks! All potentiometers are soldered on pcbs and spacing studied to be compatible with Spectrol S149/249 series and Sfernice P11, or even cheaper Alps, RadioOhm, Piher carbon pots with axe of of 3.18 to 6mm. Well, i have designed a kind of "multiformat" pcb footprint fitting with many pots easy to find ... Vertical or horizontal single or multi turn trimmers can be mounted too. Pcbs are designed to be screwed to a 5U MOTM front panel , fit with Larry Hendry's brackets and 1U rack 19" /150 . MTA connectors for +/-15V external power supply are implemented..
An idea of front panel in 19" rack is at the top of page. Bypass control inputs can be wired many different ways . Even compatibility with vintage Bi-Phase pedal switch is possible, with the same DIN plug... So here is a design idea for a MOTM style front panel, it is a "virtual" draw... Many others wirings are possible. Clic on pictures to enlarge. In samples bellow the sound source is a modular synth: VCO+VCF+VCA go inside a Biphase clone prototype fitted with TL072 and Vactrols dual cells... Phasing stages are modulated by LFO shapes ( triangle and pulse) or manualy using a CV-ADSR module in sustain mode ( act as a linear CV source between 0 and 7V ).